Want more soup recipes? Check out my cookbook, Necessary Food! 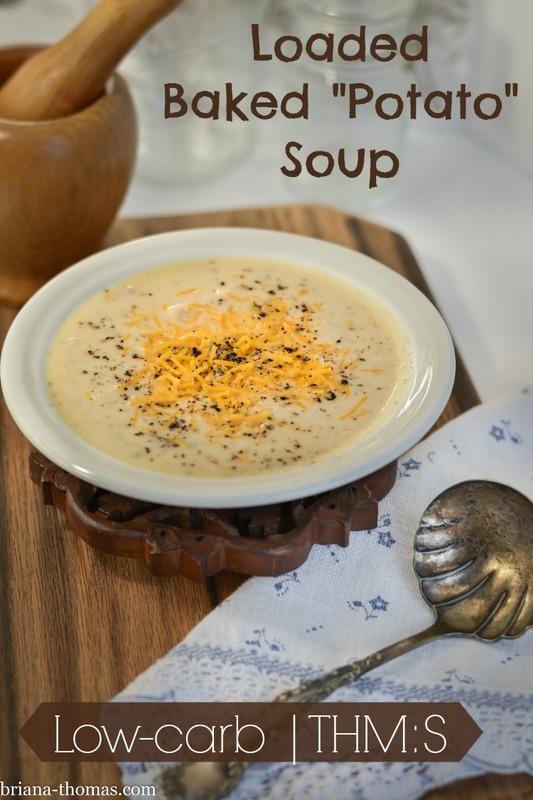 I realize that there is a recipe for “Loaded Fotato Soup” in the Trim Healthy Mama book; but to be honest, I didn’t consult it when I created this recipe. Unlike the recipe in the book, this soup is a solid S; and the recipe makes a huge pot rather than a single serving. This soup does not contain potatoes, but at supper my little sister (who happens to be the picky eater in our family) said, “This soup is too potato-ey.” Score. This soup is fairly rich, so it would pair well with a side of non-starchy vegetables (if you need something else for variety; remember, this soup does contain a whole head of cauliflower already). I used celery sticks that we had on hand for a quick side, but a nice light salad would go great with this soup. 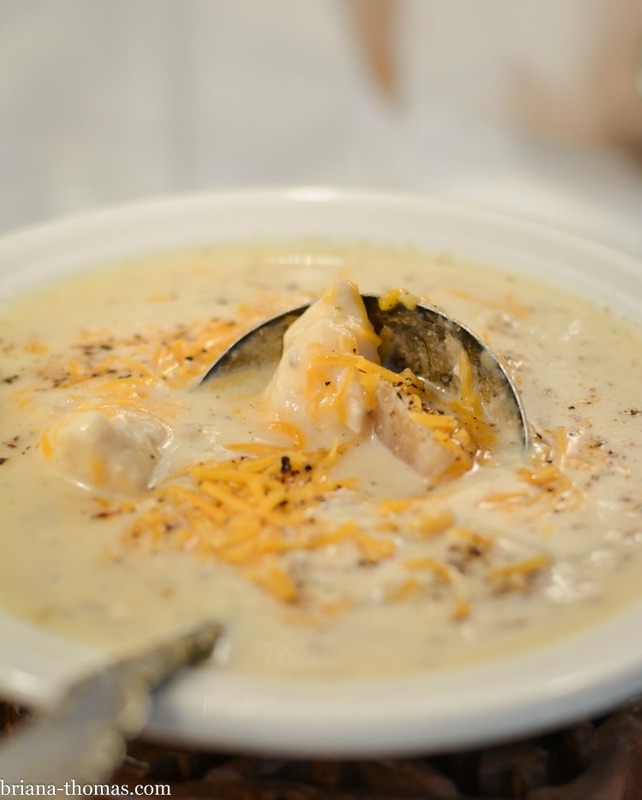 You can pin this recipe from my THM S Meals board here. In a large covered saucepan, steam the head of cauliflower (chopped into florets) in one cup of water. Trim the ends off the radishes and cut them in half. Add them to a blender with 3 cups of water and pulse a few times until they are in chunks of the desired size. Add the radishes and their water, the chopped onion, chicken bouillon, pepper, dill weed, sage, cilantro, and garlic to a large soup kettle (cover while cooking). Cook until the vegetables are tender. As the vegetables are cooking, cut the chicken into bite-sized pieces and sauté it in the butter in a non-stick skillet until the juices run clear. When the chicken is almost done, cut the turkey bacon into small pieces and cook it with the chicken. When the cauliflower is very soft, blend it, water and all, in a blender with the cream cheese. Add the cauliflower mixture and the cooked chicken (with its juices) to the soup kettle with the cooked radishes and seasonings. Add the cheese and stir. Heat until the cheese melts. Taste the soup and add more seasoning (such as chicken bouillon) if needed. Feel free to add more liquid to thin down the soup if desired. Yields 8-10 servings. Serve with cheese and bacon bits, if desired. 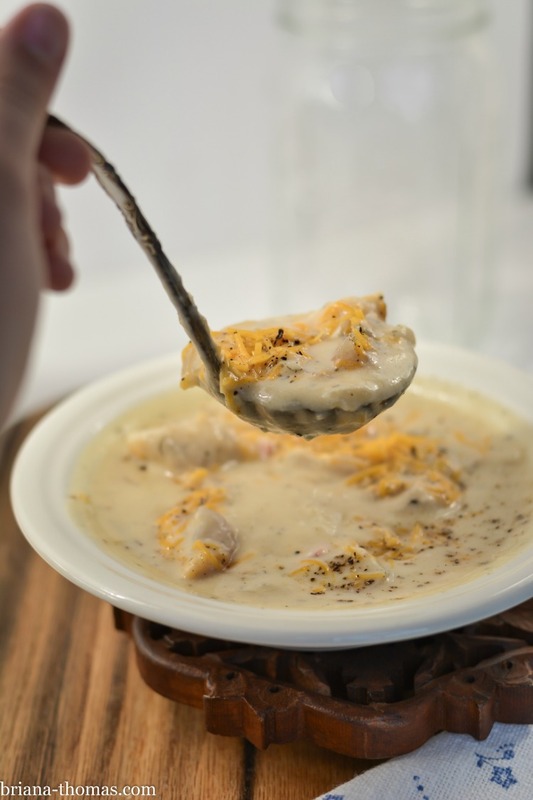 For a yummy "potato" ham chowder, use 3 cups of water and 1 cup of strong ham broth in place of the water and chicken bouillon (or chicken broth) called for in the recipe. Instead of the chicken and turkey bacon, use 4-6 cups of chopped cooked ham. Omit the butter. If you don't have bacon on hand, ½ pound of ground sausage, cooked and drained, is a great addition. I made this soup last night for a party. Some young girls (who don’t normally love veggies) gobbled it up and kept saying how good it was. My 4 year old son thanked me for making yummy soup. Thank you for sharing this recipe! That’s so neat, Esther! I love hearing things like this! Has anyone made this as a crockpot meal? I was wondering the same thing! Did you ever get a response from this question? Amazing! Delicious even after being frozen! I’m so glad you liked it, Elaine! Thanks for letting us know that it works well frozen! Is the dill fresh or dried? Any way to get away from the pinkish hue? As someone who hasn’t ever had radishes before and nervous to try, does having these in the soup make it taste like radishes or give a funny type of taste? Or do all the other ingredients kind of blend together to blank out that taste? Thanks! When cooked, radishes actually don’t have much of a flavor! All the “bite” that they have raw disappears when they’re cooked. It’s really quite amazing. Whole family enjoyed this. The first time I made it I used a daikon radish. STINKY, but it cooked out, mostly. This time I used simmered red radishes, which gave the mix a slightly pink hue, so I counteracted that with some paprika. I’m not a fan of cilantro. What would you suggest I use in it’s place? I happen to love cilantro, so I recommend the cilantro. 😛 However, feel free to use whatever herbs you like in its place. I poured it in with the rest of the ingredients, only to find it didn’t process it all and there were still large chunks of cauliflower. I wanted creamy so I got out my hand blender. Unfortunately, the texture of the whole soup is now like oatmeal. 🙁 Not creamy at all. The flavor is great though! Any way to salvage? I put some liquid in the food processor with the cauliflower after I cooked it. It came out creamy enough for us. Would you be able to make this with frozen cauliflower? How many bags would you need? Thanks! I’m sure that would be fine. I think a head of cauliflower usually equals about 4-6 cups? Thanks Briana! Hey, will your cookbook have THM types listed (like S/E meals)?? Good to hear! I had already ordered one hoping for something along those lines! Thanks for all your time and effort in creating great recipes… It has been very helpful! Made this tonight for my “meat and potatoes” man. Of course he thought it was made with potatoes!! ? We love it. My husband came up with an alternate name: Loaded baked NoTato soup. I love your recipes, simple, yet delicious! This one looks like a keeper! Can you freeze this recipe? I never have frozen cooked cauliflower before and didn’t know if freezing this recipe would change the texture or taste. I’ve never tried freezing it, so I’m afraid I’m not sure. If you do try it, make sure you don’t boil it when reheating it. Seriously the best soup I have ever eaten Briana! Is there a way to make this meatless? Would great northern beans work as a replacement for the chicken? Thanks! It looks DELICIOUS. Hi Rosie! Beans would make this into a crossover if you’re following the Trim Healthy Mama way of eating (as do most of my followers). Crossovers (combination of carbs and fats) are still healthy, just not super weight loss promoting. You can leave the chicken out, but just make sure you get some protein in somewhere in your meal. This was delicious! I made the ham version using the saved “juice” from baking the ham (I skimmed the fat off).That added so much flavor. I changed the herbs for our taste and added a shredded carrot, some diced celery, and some green beans as I just had a small bag of cauliflower and 1/2lb of radishes. I used the cream cheese, but left out the shredded cheese. I meant to top our bowls with it but forgot and didn’t miss it. This is the second soup I have made with the pureed cauliflower, and we cannot get over how well that works. Thank you! Ok I made this and it was great! I omitted the chicken and bacon and added a little gluccie at the end. Next time will add crumbled bacon on top. It really exceeded my expectations! I love your recipes! I’m making this and the pb fudge tonight. This recipe was sooooo incredibly good. My family loved it. I will be making this again. Thx for sharing. Do you think you could freeze this in serving size portions? Would it reheat well? I’ve never tried it, so I don’t know the answer to your question. I’ve heated refrigerated leftovers and that always works well, so I assume freezing would work too. of photographing your end products. My 16 year old loved this! And still thinks he ate potatoes. I love your recipes! I can’t wait to eat this soup because I just know it’s gonna turn out fantastic!! I’ve thought about it, but never gotten around to it. 😛 I’m not a big stuffing person, so it’s never been that high on my priority list. Maybe in time for Thanksgiving…haha. DELICIOUS! This was so good! My kids were shocked that there was no potato in it! I used ground turkey and a bit extra sage. Filling, satisfying, and healthy! This has become our favorite THM (probably non-THM) soup. Thanks for the recipe! Love your other recipes I’ve tried, too!! You are my go to recipe location. I love your recipes and I especially love your writing skills. Your recipes are easy to read’ the ingredients are all listed in order of use; and taste fantastic. What a talent you have! Do you use MSG-free chicken base? If so, I’d love to know the brand name. Probably not. The stuff I normally use is from a bulk food store and isn’t marked with the brand (or ingredients). Okay, so I discovere your blog about a week ago and am in love with your delicious meals!! I’ve made at least 6 already!!!! Tonight is the loaded soup and my picky 6 yr old even loves it!!! Thank you thank you!! I’m excited to cook for my family every night thanks to your recipes and my THM Book! So glad you liked it, Carolyn. 🙂 Thanks for letting me know how it turned out.